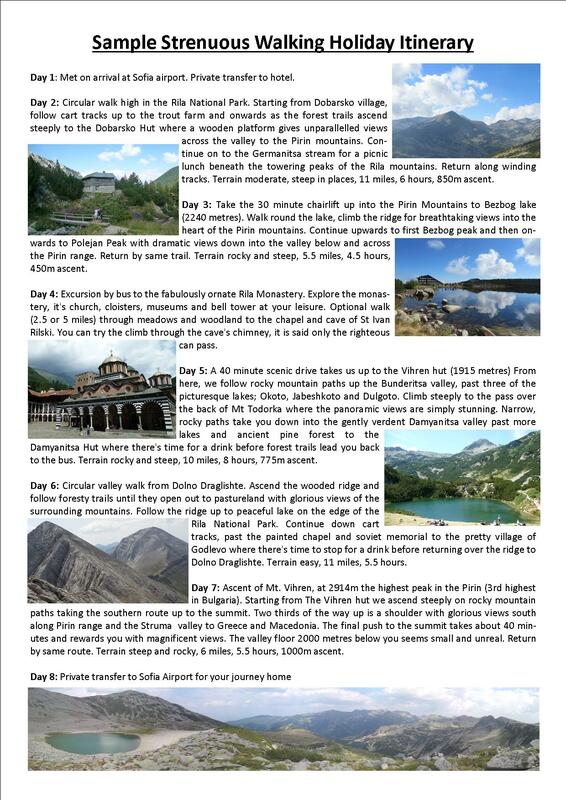 Hike the rugged terrain of the majestic Pirin mountains, trek the forested slopes of the Rila mountains and stroll verdant paths along the valley floor. Wherever you go, there are stunning views round every corner. Our walking holidays are based in south west Bulgaria. 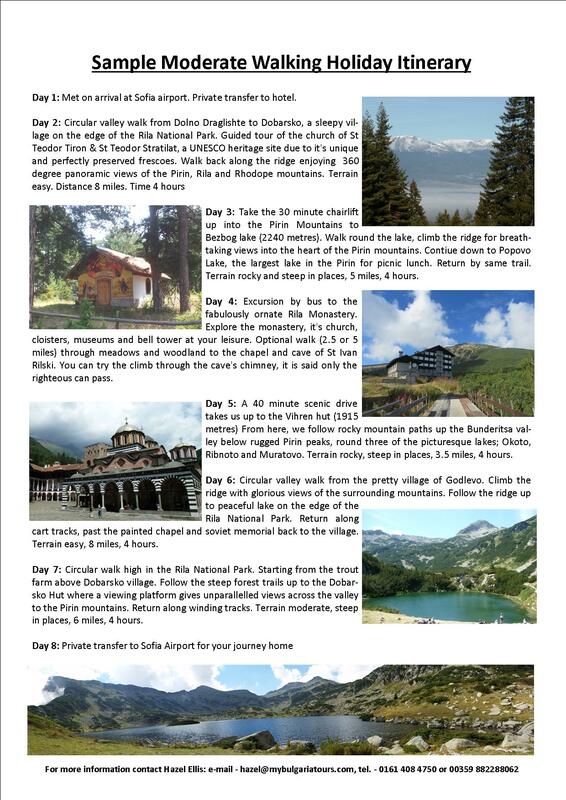 This beautiful, unspoilt valley is ringed by three mountain ranges: the Pirin, the Rila and the Rhodopes which together make a magnificent backdrop to our low level walks and provide almost endless options for high level hiking routes. We organise a wide range of guided walking holidays for groups of any size. Whether you want to get away with just your partner or intend to bring your entire rambling club with you, we can plan the perfect itinerary for you. Just let us know what length of walk suits you and we’ll organise the rest. Our guides are all English-speaking and either natives or long-term residents of the area. They will be happy to share their knowledge of the region. All our holidays are tailor-made to suit our guests. If you want peaceful rambles alongside streams and through flower meadows, we have routes to enchant you. If you prefer energetic hikes through forests to hidden glades, we know just the place. If you want to explore dramatic mountain trails over rocky passes with glorious views, we aim to please. 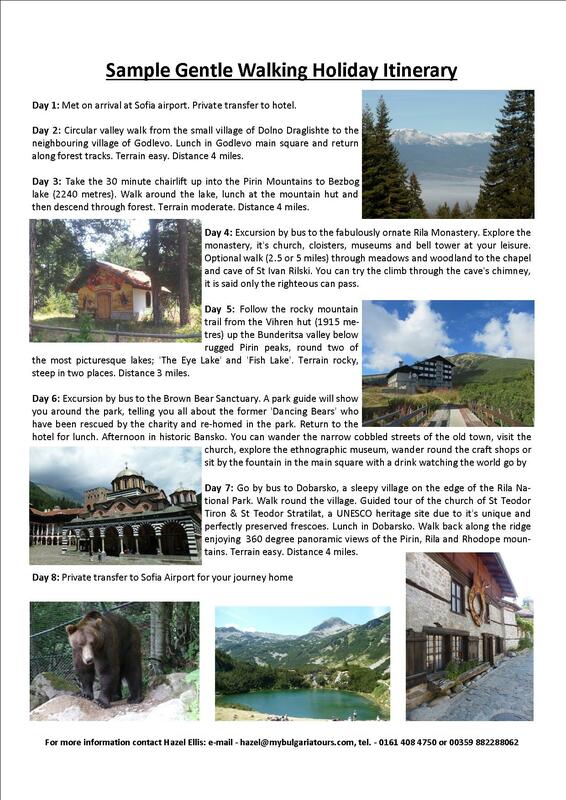 This area has some of the most exciting and varied hiking in Europe. The Pirin mountains are steep, rocky and majestically picturesque with forty five peaks over 2590 metres and numerous glacial lakes. The Rila mountains are gentler and forested, more Alpine in nature and abundant with wild flowers. The valley itself is verdant and peaceful, dotted with small villages where rural traditions live on mostly unchanged from one generation to the next. What do you want from your next walking holiday? Don’t forget, these are just examples of what we do. Are you a big group who want a choice of routes each day? Do you want to mix in some biking with your walking holiday? Want your holiday to include sightseeing or wine tasting?